I spent the day at Foro International de la Justicia Climatico de los Pueblos (the International Forum of Climate Justice - Dialogue of the Communities) and heard many interesting presentations. After speaking on the panel The Rights of Mother Earth: The Time Has Come for a New Paradigm, I attended another panel on the rights of Mother Earth called Los Pueblos Indigenas, los Derechos de la Madre Tierra y la Justicia Climatic (Indigenous Peoples, the Rights of Mother Earth and Climate Justice). The gymnasium was packed with approximately 400 people. There were three panels on the Rights of Mother Earth today. Roly Escobar Ochoa from CONAPAMG (Guatemala) spoke first about the negative impacts that a miming company had on a local community. Sandy Gauntlett from New Zealand started off with a Maori song to thank the people of Mexico for having him here. He asked for support and solidarity for the Maori people. Ben Powless from the Indigenous Environment Network (IEN) spoke about the need for free, prior and informed consent of First Nations in Canada. He highlighted the similar challenges that the indigenous peoples of Mexico faced in mining and other development projects. He highlighted IEN’s main messages of ‘Leave it in the ground,’ reducing emissions by 95%, the need for industrialized countries to pay for their ecological debt and the need for real solutions that will benefit communities and not simply corporations and government. He stressed the importance of striving to live well (not just better) and to live on harmony with nature. In the afternoon, I attended a panel on Reducing Emissions from Deforestation and Degradation (REDD). There was a much smaller crowd for this panel – about 60 people – so we all formed a semi-circle around the panelists which created a more intimate atmosphere. Tom Goldtooth was the moderator and began the panel with an introduction on IEN and talked about the need to address environmental racism. The panel consisted of speakers from Carbon Trade Watch, Global Forest Coalition, Global Justice Ecology Project and Society for Threatened Peoples International. The panel of experts attempted to demystify the complexity of REDD, REDD+ and REDD++. Brent, Leticia and I attended the opening ceremony for 'Foro Global Por La Vida La Justicia Ambiental Y Social' (Global Forum for Life and Environmental and Social Justice) today. 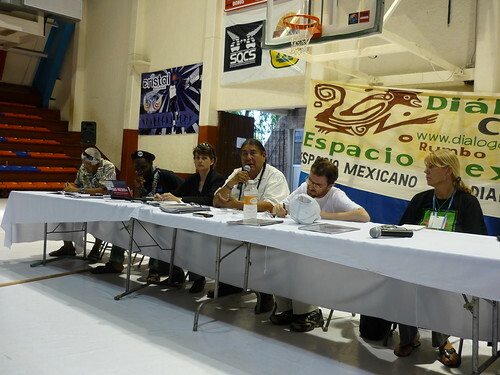 The forum, one of three alternative spaces to the UN climate change conference, is organized by La Via Campesina. The ceremony was held in a open-air sports stadium. The atmosphere was one of excitement, activity and solidarity. In front of the stage, there was an ornate circle of fruit, candles, flowers and other offerings made to Mother Earth in part as a way to ask permission to be here. 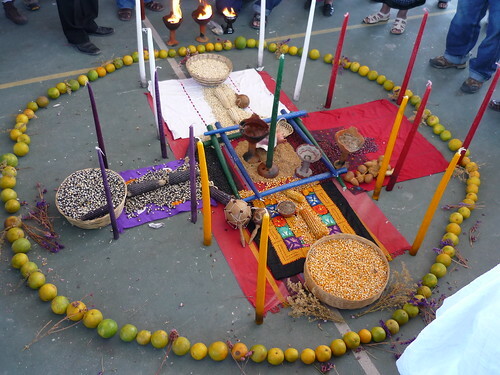 The ceremony was lead by Guatemalan and Mexican Mayans. They asked Mother Earth to ensure that our leaders do not make decisions that cause more damage. They acknowledged that sometimes we forget to thank Mother Earth for all the things she gives us and said that we are here to be reminded of the beauty of Mother Earth. There will be another ceremony on Monday at 5 a.m. that all can participate in. 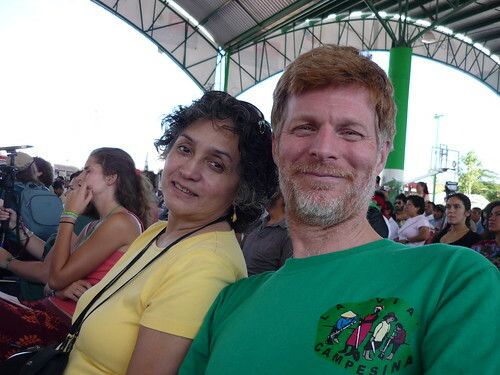 La Via Campesina went on to welcome participants from countries from all over the world including Argentina, Brazil, Bolivia, Canada, Haiti, El Salvador, Honduras, India, Mozambique, Nicaragua, Paraguay, Dominican Republic, the United States, Japan, France, Mexico, Guatemala and Venezuela. Mexico and Guatemala had by far the most people present. The first speaker talked about the serious challenges that Mexico faces because of environmental damage. He spoke of the challenges that social movements face but highlighted the need to look beyond these challenges in order to unify our efforts. He denounced the governments of the world for their secret deals and false solutions but reminded the audience that we the people have the power to challenge and change that. Canada, along with Japan and Russia, is blocking the second round of emission reduction commitments under the Kyoto Protocol to ensure that it is not extended beyond 2012. Rather, they are pursuing ineffective and even harmful measures including a non-binding, voluntary Copenhagen Accord and a pledge and review process. The Kyoto Protocol is the only legally-binding international agreement aimed at curbing greenhouse gas (GHG) emissions. It recognizes that developed countries are primarily responsible for the current high levels of GHG emissions in the atmosphere as a result of more than 150 years of industrial activity. It is a significant first step in setting binding targets for 37 industrialized countries and the European community for reducing GHG emissions amounting to an average of five per cent against 1990 levels over the five-year period 2008-2012. Although Canada was a signatory to the Protocol, in 2006, the Harper government tabled a budget that failed to allocate any funding to implement the legally-binding Protocol. Later that year, Environment Minister Rona Ambrose said Canada had no chance of meeting its targets under the Kyoto Protocol even before it began. Just days before the current climate talks began, the unelected Senate killed Bill C-311 without any democratic debate. Bill C-311 would have been the only piece of legislation aimed at reducing Canada’s greenhouse gas emissions. Now in Cancún, Canada along with a small number of powerful nations, are working towards the elimination of the Kyoto Protocol. This morning, Coalicion de Organizaciones Mexicanas Por El Derocho Al Agua (COMDA / Coalition of Mexican Organizations for the Right to Water) organized a press conference in Mexico city. Maude Barlow (Chairperson for the Council of Canadians), Andrea Harden (Council of Canadians climate campaigner) and Claudia Campero (COMDA/Blue Planet Project organizer) spoke about the COP climate negotiations, the relationship between water and climate change and the need for climate justice. After the press conference, Maude Barlow, Claudia Campero and I met with several Mexican civil society organizations to share stories about our work on water issues. We met with Alicia Cariquiriborque from FIAN, Jaime Rello from the Popular Union Emiliano Zapata (UPREZ, part of the Urban Popular Movement), Maria Gonzalez's organization from the Mexican Institute for Community Development (IMDEC) and Silvia Emanuelli from Habitat International Coalition. Bruce Power has applied for a licence at the Canadian Nuclear Safety Commission (CNSC) to ship 16 radioactive steam generators through the Great Lakes and St. Lawrence Seaway to Sweden. City mayors, US Senators, environmental groups, First Nations communities and other civil society groups have raised many important concerns about this shipment. Nearly 80 groups provided written submissions and half of them intervened at a public hearing on Sept. 28-29, 2010. The CNSC extended the deadline to Nov. 22 for supplementary submissions and is now poised to make a decision by Dec. 22, 2010.